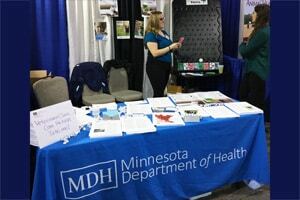 UMASH researchers from Minnesota Department of Health (MDH) exhibited for the first time at the Minnesota Veterinary Medicine Association (MVMA) conference February 23-25, 2017. Staff engaged with veterinarians and veterinarian technologists about how the MDH unit Zoonotic Diseases Unit works at the human-animal interface. Care packages were provided to veterinary clinics with information about reportable diseases and a rabies risk reference book. Educational handouts and other materials were also distributed.